R.F. MacDonald Co. has been in the business of supplying and servicing boilers and pumps to industrial and commercial customers in California and Nevada for over 50 years. For your convenience we maintain sales and service offices in a number of strategic locations in California and Nevada. Our experienced technical sales staff will carefully evaluate your needs and provide custom equipment solutions with reliability and process improvement in mind. We represent the highest quality equipment manufacturers in the industry to ensure we are providing the most efficient and environmentally clean equipment available. Some of our boiler brands include Cleaver Brooks, Fulton, Camus, CB Natcom and some of our pump brands include ITT Goulds, Grundfos, Seepex, G&L Pumps and Blackmer and many others. Our factory trained and certified technicians repair all makes and models of boilers. We also provide in-house fabrication services for assembling boiler packages and custom systems into pre-piped and wired skids, simplifying field installation requirements. Our field services include troubleshooting, repair, certified welding, operator training, and installation. We believe in servicing what we sell, 24 hours a day, 7 days a week. With a large fleet of service trucks on the road, we provide full field service capabilities from all locations. Our huge boiler and boiler parts inventory combined with our multiple locations ensures fast and reliable service anytime day or night. Boilers are also available for temporary requirements. We offer many special services for customers such as parts, Mobile and Rental Boilers, Boiler and Pump Training and a growing Ultra Low NOx knowledge bank on our website at www.rfmacdonald.com. We have over 50 years experience in boiler installation, service and maintenance and we know the California and Nevada market. We represent many high quality boiler equipment manufacturers to ensure we apply the right product for your application. Our experienced technical sales staff will carefully evaluate your boiler needs and provide custom equipment solutions with reliability and process improvement in mind. Pumps are increasingly becoming components of integrated systems in order to provide better control and efficiency of system processes while helping conserve manpower. At the same time they are increasing in complexity and functionality and as a result becoming more complex mechanical devices. This poses a number of challenges for pump operators in maintaining systems and operations at optimum performance levels and this is exactly where R.F. MacDonald Co. can help. We offer a wealth of experience with many name brand pumps and carry a huge inventory of parts to provide fast and reliable service. As a boiler operator or owner you may be feeling overwhelmed at the amount of information and technical details that you are now required to understand, and rightly so. The new California boiler emission regulations throughout the state are complicated and in many cases there is no quick fix to the compliance solution. That is why we at R.F. MacDonald Co. created a special informational section to our website to arm you with as much information, in as easily accessible a format as possible. "The Seepex pump along with the quality and speed of the R.F. MacDonald service when the pump requires any type of part or service is truly unsurpassed. When we replacaed our metal lobe pumps with the Seepex our jamming issues were eliminated"
Castoro Cellars began as a small family venture producing a few barrels of wine for family and friends, but over the last two decades has added staff, equipment, facilities and vineyards to blossom into a custom crush operation producing about 60,000 cases of wine per year. One of the problem areas for the winery processing has been their MUST Pump. MUST consists of the skins, seeds and juice of freshly crushed and destemmed grapes. Sitting below the crusher/ destemmer the MUST pump transfers product to the fementation tanks or presses. The metal rotary lobe pumps being used by the winery were consistently getting jammed and required the entire line to stop while an operator disassembled, cleared, reset and restarted the pump. After three harvest seasons with these exasperating pumps, Castoro Cellars was seeking a more efficient option. R.F. MacDonald Co. reviewed the problems with the existing MUST pump before designing and developing a customized Seepex Progressive Cavity Pump Model BT1306L. This particular pump contains a metal rotor with a rubber stator that can flex and compress when it encounters solid material that would have jammed the previous equipment. A 40 HP right angle gear motor and a custom made auger helps to continuously convey the solid product into the pump cavity. The pump also featured a custom-made open hopper to provide an efficient recepticle from a Delta8 Crusher, capable of processing up to 80 tons of material per hour, which is about 320 gallons per minute. On average the winery pumps about 15,000 tons per year through their MUST pump, and has been averaging 3-4 years between stator changeouts. The variable frequency drive is able to adjust the speed of the pump based on the level of the material in the hopper. The pump is automatically controlled but also features a remote speed pot that allows the operator to use a hand-held device to control the speed, stop the pump in emergencies and even reverse the direction to clear any jams downstream. An integral dry-run sensor thermal couple was included to detect a temperature increase that would occur at the stator/rotor interface in the event of a dry run condition. The temperature increase triggers the sensor and the pump automatically turns off to prevent any damage to the internals. The entire pump system was mounted on a wheeled cart so the winery could easily move the assembly to the shop for maintenance and repairs, as well as store the system during off harvest seasons. INOXPA's range of high shear mixers provides a solution for the processes of dispersion, emulsifying, homogenisation and disintegration of solids in a wide range of products in the wine and food-processing industries. HAYWARD, Calif., Oct. 3, 2018 -- R.F. MacDonald Co., a leading provider of boiler and pump equipment for commercial and industrial solutions, today announced that it has been recognized by the San Francisco Business Times as one of the Bay Area's largest family-owned businesses. The company has been previously recognized by the Timesand other leading publications for achieving consistent, long-term revenue growth. The company's strong revenue growth in fiscal year 2017 was driven in part by its strategic acquisition of Process Equipment Company, which held distribution agreements for several key industrial pump product lines in the Southern California market. "We are pleased to be recognized by the San Francisco Business Times in this year's Book of Lists," said Jim MacDonald, President of R.F. MacDonald Co. "Over the years, we have enjoyed strong organic growth in our commercial and industrial boiler and pump business. Adding the Goulds Pumps product line in the Southern California market was crucial in helping us grow our overall pump business, and will help us achieve our future revenue targets," he added. R.F. MacDonald Co. was founded in 1956 and has nearly 300 employees throughout California and Nevada. Each department is dedicated to the sales and service of boilers and pumps for commercial and industrial applications. The company also employs experienced engineers to assist contractors, engineers and customers in equipment selection, installation planning, layout permitting and project supervision. For more information on RF MacDonald, please visit www.rfmacdonald.com or connect with us on LinkedIn, Twitter, or Facebook. Want to Reduce Annual Energy Consumption? Come See Us at the Northern CA Facilities Expo! R.F. MacDonald Co. can help with highly efficient hot water modular and steam firetube boilers. Steam boilers assist with propulsion of a product, steam sterilization and building heating. To get more information, come see us in Santa Clara at the Northern CA Facilites Expo September 26-27, 2018 booth 354! We will have boiler tube smples and other giveaways! The compact and robust design of the Kiber NTE progressive cavity pump makes it ideal for transferring whole or destemmed grapes. And due to its design it can be installed right under the destemmer. It also can be used for the process of devatting. Operating principle: Friction between the rotor and the stator creates vacuum in the inlet area thereby helping the entry of the product into the pump. The turning motion of the rotor makes the cavities between the rotor and the stator move forward and transport the product to the outlet. Motor: 3 ph 230/400 V (3 kW), 400/690 V (>3 kW), 50 Hz, IP-55. Connections: Garolla, Clamp, Flanges, DIN, etc. Helicoidal Pumps have a screw-shaped impeller to create a more gentle transfer of wine while eliminating clogging. Inoxpa created the Helicoidal RV pump for wineries to improve the pump-over process where high capacity and minimum destruction is required. The design of the pump contributes to a better extraction of tannin, coloring matter of wine and reduced lees formation — all resulting in a high quality wine. R.F. MacDonald Co. will be at the WIN Expo Thursday, Nov. 30. RFM’s uniquely fabricated wine pump carts are a best seller in Sonoma County. Stop by Booth #240 for cutaways and giveaways. R.F. MacDonald Co. Hands-On Pump Workshop has been rescheduled to Nov. 8/9. We currently have two spots available! Find out more and register: http://www.rfmacdonald.com/training/Handson-Nov8-9-RP.html. R.F. MacDonald Co. will be hosting its last 2017 Hands-On Pump Training class in Rohnert Park Oct. 11-12. Read the class outline for more information or register:http://www.rfmacdonald.com/training/Handson-Oct11-12-RP.html. Join R.F. Macdonald for the Northern CA Facilities Expo in Hayward, CA for information on boiler systems, pump systems and services/training for your industry. This event meets the facilities engineering, maintenance and energy management needs of industries such as high-tech manufacturing, government, health care, hospitality, finance, education, information technology, software development, shipping, utilities and many others. Make any machine a smart machine with the i-ALERT2 Equipment Health Monitor. The ITT Goulds i-Alert2 will work on any rotating machine and detect abnormalities that traditional alarms can’t. With the monitor’s library of diagnostic information, a corrective action can be found instantaneously. i-ALERT2 combines the latest in Bluetooth® low energy and sensor technology into a rugged, safe, industrial certified package. i-ALERT2 puts monitoring and diagnostics in the hands of everyday users, empowering anyone to safely monitor equipment from a distance. Learn more by watching the i-Alert2 capabilities video below. Give us a call for personal assessment of you application — 510-784-0110. On Friday, June 23, 2017, the RFM sales team hosted its 4th annual Customer Appreciation Open House. Roughly 30 customers attended and each went home with an RFM gift back and special giveaway. Join Us June 23rd for a Meet & Greet with Our Local Sales/Service Team in Rohnert Park! We're having a meet and greet with the local sales and service teams for our Rohnert Park office. We'll have product displays, catered lunch and raffles. Join us! R.F. MacDonald Co. installed Camus DynaFlame boilers at Woodbridge Winery Facilityto acheive less than 10ppm NOx levels and increase operation efficiency more than 10 percent. Contact R.F. MacDonald Co. to discuss increasing your operation efficiency — 510-784-0110. Spend less time collecting data and more time fixing problems. The i-ALERT mobile app has the ability to scan multiple i-ALERT 2 devices within range to quickly and safely inspect multiple machines. SMART Digital Dosing pumps propelled a new era of dosing technology. These intelligent pumps simplify the operator’s job with enhanced drives and controls. Low operation costs, less maintenance and high accuracy make the SMART Digital Dosing technology a worthy investment. We'll have a premium, prize-bottle of wine, RFM corkscrews, pens and more. Come visit us at Booth #1511! R.F. MacDonald Co. will be presenting the Boerger rotary lobe pump at the Unified Wine Symposium Jan. 24-26. Pushing the boundaries of winemaking, check out Boerger at the RFM booth — #1104 and #1106. R.F. MacDonald Co. provides a full schedule of boiler and pump classes that are attended by hundreds of participants each year throughout California and Nevada. Each class offers highly qualified speakers including manufacturers, industry experts and our own highly experienced technical personnel. Most of the classes feature class curriculum along with in-depth, hands on training programs. "...really well organized and very comfortable. We look forward to sending more people.Thanks!" -Chad Oney, Senior Parts Coordinator, S. Martinelli & Co.
R.F. MacDonald Company is your pump solutions provider. We have a wealth of experience with all types of pumping applications in the winery process. With our (7) locations in California we are always available for site visits to assist with your pumping needs. A Hydra-Cell D04 pump is known for its proven reliability and seal-less design that guarantees no leakage. In addition, the multiple-diaphragm design delivers virtually pulse-less flow, which enables smooth operation, even at the required high pressure. Charles Krug, Napa Valley's first winery established in 1861, has been owned and operated by the Peter Mondavi family for more than four generations. Charles Krug is recognized as an innovator and pioneer in the winemaking industry, with their exquisite line of critically acclaimed wine vintages being enjoyed by aficionados and casual consumers alike. To assist the fermentation step in the winemaking process, Charles Krug was utilizing a steam boiler to heat their wine to temperatures below 90°F. Unfortunately, the boiler was an older model and relies on a heat exchanger to produce high pressure steam; an unnecessarily expensive and inefficient technology. On top of that, the steam from the boiler was being routed to several different processes throughout the plant. Looking to improve their production process, Charles Krug consulted with R.F. MacDonald Co. to bring the quality of their wine to its fullest potential. Charles Krug, Napa Valley's first winery, was exploring options to upgrade their boiler and improve their fermentation process, as well as consolidate their boiler and condenser into a single unit. R.F. MacDonald Co. recommended the Cleaver-Brooks Clearfire Model CFC, a boiler system that circulates water through both the boiler and a chiller to achieve any desired temperature, hot or cold. This feature allows Charles Krug to use just one system for both the heating and cooling of their wine tanks, which require different temperatures at various stages throughout the fermentation process. Charles Krug approved R.F. MacDonald Co.'s recommendation, and the existing boiler was replaced with two Cleaver-Brooks Clearfire boilers. The Clearfire CFC boiler features a combustion system with a pre-mix down firing burner, which is fundamental to achieving efficiencies up to 99% and NOx levels less than 20 ppm. Using natural gas and propane, the Clearfire is suitable for central heating and indirect hot water supply at working pressures up to 3 bar or 5 bar, depending on the required output. A key feature to Charles Krug's application was the Clearfire's capability for simultaneous heating and condensing. Along with the Clearfire, R.F. MacDonald Co. also installed a Camus Boiler for barrel rinsing and domestic water wash downs, which decoupled the boiler from supplying steam to multiple processes at one time. Throughout the installation process, R.F. MacDonald Co. worked in conjunction with the installation crew and provided invaluable expertise and input during the design phase. R.F. MacDonald Co. is now the continuing service provider for the equipment, and proactively monitors and maintains the boiler system at the Charles Krug winery. The boiler system itself is continuing to provide Charles Krug with the freedom to control thermals at the temperature they want, at the time they want. The fuel savings gained from the more efficient boiler, combined with the ease of operation, have culminated into an investment into boiler technology that Charles Krug considers to be a great decision. From HVAC to the complete wine making process and waste handling, RF MacDonald Company is your single source partner for complete pump and boiler solutions specifically designed for the wine industry. With over two million dollars in inventory, you get fast and reliable service. Need a more effective pump for your operations? R.F. MacDonald Co. carries a wide array of options, such as the BJM Stainless Steel Submersible pump line of products. These corrosion resistant pumps are ideal for a wide variety of liquid or solid wastes and some models also offer shredding capabilities with non-clog impellers. Get your pump moving at the speed of your production timeline! Contact an R.F. MacDonald Co. facility near you and see how we can help your operation achieve increased efficiency and cost savings. Boiler tuning is necessary to maintain efficiency as well as to ensure reliability and safety. Tuning the burner during the spring and again in the fall is recommended because of the dramatic air temperature and density changes that occur during these seasons. Both steam and hot water boilers need to be tuned regularly. It is important that a boiler is hot before it is tuned. A cold boiler will throw off the actual operating O2 and CO readings. Below are the conditions for a natural gas-fired boiler, which is warm, has a load and has a zero pressure reading on the boiler’s steam gauge. 1. Insert the probe into the stack to monitor stack temperature, O2 and CO readings. 2. Power the burner switch, and place the burner in the manual mode and at the low-fire point. The burner will now be under the control of the Burner Management System (Programmer), so expect it to go through its sequence of pre-purging and trial for ignition. 3. With a pressurized boiler, check the O2 analyzer for the O2 and CO readings. If the CO is above 50-100 parts per million, the burner is running rich, and either the fuel needs to be cut back or the air increased. A good excess air at low fire is between 5-8% O2. Also, check the manifold pressure at the burner entrance to make sure it is within the operating parameters as detailed by the manufacturer to assure proper input. 4. Once low-fire is set, manually increase the firing rate incrementally while observing the flame and looking for signs of sooting or instability. 5. At the same time, watch the analyzer at each control point and make cam adjustments (and possibly linkage adjustments) to bring the fuel/air ratio as close to the goal as possible while maintaining safe firing conditions at all times. If the boiler can hold 3% O2 or 15% excess air from medium to high-fire with no more than 50 PPM of CO, the adjustment tuning is excellent. 6. Take into consideration where the boiler fires most of the time. Set the combustion to the maximum efficiency at that particular rate while maintaining a safe margin of excess air. 7. Arriving at high fire, and making the adjustments along the way to the cam/linkages or actuators, check the manifold pressure again to ensure there is full input to the burner as defined by the manufacturer. 8. Manually bring the burner back to low fire, checking the combustion readings as it descends, and make minor tweaks as needed. During this time, watch the linkage movement on a single-point positioning system to ensure there are no hitches or slippage. Confirming this, switch the control from manual to automatic, allowing the burner to modulate on its own. 9. When the burner has reached its stability point with regard to load matching, watch the boiler pressure in relationship to the stack temperature. A well-tuned boiler/ burner package will register a stack temperature between 50-100 degrees above the saturation or water temperature. Anything above this will indicate a dirty boiler or one that has flue gas bypass issues or is badly scaled. 10. Check the safeties, especially the low-water cutoff, the ALWCO and flame scanner. A boiler that is out of tune increases operating expenses as energy exits through the stack. In addition, soot can build up to the point that the tubes overheat and crack or break from their welds, leading to extensive downtime and excessive repair costs. This two-day course is designed for operators, maintenance technicians, or anyone interested in learning how to safely and reliably operate centrifugal pump equipment. Participants will learn correct operational procedures and preventive maintenance techniques to extend their pump system's life span and reduce life cycle costs. This seminar is designed for operators, maintenance technicians, or anyone interested in learning how to safely and reliably operate centrifugal pump equipment. Be sure your boiler operators are equipped with the knowledge they need for safe and efficient boiler operation. Enroll them in one of three Boiler Operator Workshops scheduled within Northern California before the end of the year. This two-day workshop is designed for maintenance, plant, stationary or mechanical engineers as well as maintenance personnel who are responsible for new, repair and troubleshooting of boilers. However, anyone seeking a basic working knowledge of boiler room equipment, with select hands-on instruction will benefit from this class. CWEA & AFE Certified. Now is the time to do a final check of your equipment to ensure it is harvest throughput ready, especially if it has not been running to full capacity since last season. Our factory trained and certified technicians are available for field service throughout California and Nevada, 24 hours a day, 7 days a week. Field services include inspections, troubleshooting, diagnostics, repair, installation, monitoring, and calibration. Contact an office near you to speak directly with a local representative who can personally assist you with your facility equipment requirements. Portable Cart Pumps are an excellent way to meet your pumping requirements. The portability allows them to serve in different locations throughout your facility without having to sacrifice durability and capacity. Customized options range from simple fluid pumps to heavy-duty pumps that can handle abrasive debris, with variable frequency drives, onboard controls and protection systems. Review the case studies below to see how other wineries are using Portable Cart Pumps in their operations and then speak with one of our offices today to see how we can customize a solution for you. After the outstanding success of his Napa Valley winery, Robert Mondavi founded the Woodbridge Winery. However, as the expanding market need increased, production also increased and so did the amount of wastewater generated by the plant operations. Woodbridge Winery was faced with the challenge to meet the production waste stream demands, maintain optimum production at peak efficiency, and meet local and federal regulations, all while adhering to high corporate environmental standards. The winery wastewater contractor, along with an engineering firm, and hydraulic experts, designed an effective wastewater treatment process. A pump system would collect the maximum output of the plant into a wet well, move the effluent to an equalization tank, through a wastewater reactor, and finally, to aerobic holding ponds. The treated wastewater would be used to irrigate the vineyard, thus providing a "green wastewater process”. If your facility is facing a challenging condition regarding your boiler or pump functions, contact an R.F. MacDonald Co. office near you. While many customers opt to decommission an old boiler, R.F. MacDonald Co. can provide considerable savings by upgrading a mechanically sound boiler to current emission, code and safety standards. Take a look at these before/after shots of the retrofit of a 1950's boiler that now meets current emission and safety standards. Let us know if we can help your facility renew an older existing boiler. Today, most facilities are focused on increasing efficiency and decreasing fuel costs. Many are finding the job easier with a burner management system (BMS) that helps produce reports on a regular basis to monitor processes and detect trends. The power of an advanced burner control system is that it can manage and report on multiple aspects of a boiler control such as; fuel usage and hours of use, stack temperature, lead/lag sequencing, boiler efficiency, and temperature/pressure. A BMS controls every aspect of a burner to ensure proper sequencing and safety. It protects against the malfunction of fuel-firing equipment and reduces possible errors by following the proper operating procedure. The BMS is designed to prevent firing unless a satisfactory furnace purge is completed. It will also delay equipment startup if certain permissive interlocks do not take place. After meeting these criteria, the BMS sequences the burner through its different stages from pre-purge, lighting the pilot flame through the main flame light-off. Issues such as high/low main fuel gas pressure or combustion air pressure will sound an alarm. These types of problems will independently appear on the display of an advanced control system’s HMI; however, a standard burner management system does not provide this type of data without additional expanded modules mounted and wired directly on the BMS control. A boiler operator can install additional flow meters to be monitored with an advanced control system that is not available with a BMS controller alone, thus requiring an additional independent control to monitor and display this information. The advantage of an advanced control system is that it ties all of this equipment into one package and displays it on one screen instead of having multiple devices to accomplish the same thing. The complete article also includes information on: Troubleshooting Made Simple, Programmable Systems, Custom Controls and includes several Instrument and Control Case Studies. PumpSmart pump control systems provide real-time control and protection of your pumps while also providing valuable process insight. By protecting against unplanned pump failure due to process upsets, we can keep your process running longer and eliminate unplanned repair activities. By Right-Sizing your pumps to your system, PumpSmart can reduce not only your energy consumption, but the wear and tear on your process system. PumpSmart offers automatic pump control by integrating the pump controller in the drive. No external controller is required, making PumpSmart a simple and cost-effective solution for your basic pumping needs. 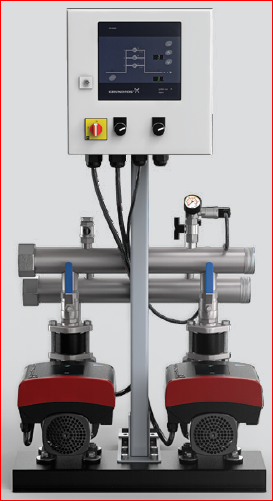 PumpSmart process control features; single pump or multipump applications, advance pressure control, cavitation control and PID Smart Flow. Standard PumpSmart systems come equipped with advanced process control features that help optimize your pumping system for maximum uptime, reliability and energy savings. PumpSmart is pump-specific and was developed to protect the pump and optimize pump control. The systems can be applied to any manufacturer’s centrifugal or positive displacement pump. Call our office today to see if PumpSmart could help your facility be more efficient. We are now a Wright Flow Pump Authorized Service Center! R.F. MacDonald Co. is proud to announce that we have been approved as a Wright Flow Technologies Authorized Service Center. Wright Flow Authorized Service Centers provide factory authorized service, parts, accessories and warranty replacement work within their designated region. Currently, both the Fresno and Santa Fe Springs Facilities are authorized for Industrial RLP, Sanitary RLP, Revolution, TRA10/20, and TRA400/500. Give us a call today to learn more about the products and services we offer, or to discuss how we can help your plant maintain optimum efficiency through a consistent maintenance and repair program for your facility pump and fluid handling equipment. Introducing the new Cleaver-Brooks ClearFire-LC (CFLC) high-capacity, condensing hydronic boiler. The CFLC uses AluFer heat-transfer technology and a high-turndown burner with advanced controls to deliver up to 98% efficiency and ultra-low emissions in a compact footprint. Available in six sizes from 4,000 to12,000 MBTU/hr, the ClearFire-LC can save a facility as much as 50% in operating costs compared to a traditional steam or hot water system. The CFLC is a cost-effective alternative to installing multiple smaller boilers or less-efficient, non-condensing boilers of a similar capacity. The fully integrated system includes the boiler, burner and controls for multiple lead/lag configuration. Many winery facilities are replacing their steam boiler with a hydronic one to increase efficiency and decrease operating costs. Before condensing boiler technology was introduced, boilers operated at a maximum of 80 percent to 85 percent efficiency. Today, condensing hydronic boilers can operate at efficiencies up to 99 percent. Hydronic boilers can be used for either building heat or process hot water applications. Some facilities that convert from a steam boiler to a condensing one reduce their energy bill by as much as 50 percent. A condensing boiler is more efficient than a steam boiler because it extracts both latent heat and sensible heat from combustion exhaust. To learn more about hydronic heating systems and how they can help your company reduce energy costs for your facility call an R.F. MacDonald Co. office near you. Come by our booth #1411 and see how our large array of boiler and pump products and services can help streamline and enhance your vintner operations. Our experience with wineries such as Wente, Mondavi Woodbridge Winery, E&J Gallo, Franzia, Rodney Strong Vineyards, Sonoma Wine Company and Delicato Family Vineyards have given us a vast amount of experience with wine growers, processors and bottlers. Purchasing a pump that is capable of handling the harsh conditions of must processing is essential to maintain process flow and production capacities. Read this case study on how the Bear Creek Winery replaced their old pumps with the Börger FL518 stainless steel pumps. The new units provided quick and easy maintenance with cost effective liners and lobe tips. The mechanical seal design is highly resistant to abrasion, enabling longer operation before seal change outs. The pump units were cart mounted for optimum flexibility throughout the plant. Call one of our offices to find out more about solutions to your most challenging pump or boiler issues. Don't miss this opportunity to train your staff on the repair and maintenance of pumps that are critical to your operation. These two-day courses are designed for maintenance and operator personnel who are responsible for repair and troubleshooting of Centrifugal Pumps and Mechanical Seals, as well as engineers that want to have hands on experience for installation and repair. The courses provide a true hands on experience for optimum learning. Now is the time to replace your existing boiler to achieve low emissions and high efficiencies during the peak processing season. Read this case study on how one winery replaced their old boilers with high thermal efficiency Camus DynaFlame Boilers. These units are compact, achieve low NOx emission requirements, and provide high efficiencies. The result is increased fuel savings, better temperature range control, and higher overall reliability. Don’t wait until peak processing season! Call one of our offices today to get your boiler or pump system evaluated, serviced, and operating at optimum levels. This hominy and bean producer was originally looking for a used boiler, but soon realized that it would be more cost efficient in the long run to install a new steam plant. R.F. MacDonald Co. provided a single source for the complete end-to-end design and integration of an SCR based system. When E&J Gallo came to R.F. MacDonald Co. for a solution to improve maintenance turnaround times and lower repair costs on their MUST pumps, R.F. MacDonald Co. recommended upgrading to Börger EL-1550 rotary lobe pumps. At 1,200 gallons per minute and pressures up to 80 psi, the debris in MUST was causing substantial damage to existing rubber lobe pumps. Upgrading this high volume wine facility to Börger EL-1550 rotary lobe pumps reduced mechanical failures, increased productivity and provided easy maintenance. The Seepex BWC pump bridges the gap between positive displacement sanitary pumps that provide low flow and high pressure, and centrifugal pumps that offer high flow and low pressure. Seepex has united the best of both designs into one space saving and compact package capable of a controlled flow rate of 11 GPM and a maximum pressure of 60 PSI. This new pump design is comprised of very few components, simplifying maintenance and reducing the overall cleaning period. Visit the webpage below to view a video, download a product brochure and link to more information, or give us a call today at an office near you. R.F. MacDonald Co. can help you resolve your facility pump needs. JBT FoodTech, a citrus packing house service provider, was utilizing solenoid style dosing pumps to apply a wax coating on fruit products to preserve freshness and protect the produce. The pumps were prone to pulsations that cause uneven coating and lead to frequent maintenance downtimes. Since packing houses are so dependent on the reliable performance of their machines, JBT FoodTech needed a way to improve the flow of the packing line by upgrading the dosing pumps. JBT FoodTech asked R.F. MacDonald Co. to evaluate their current situation and provide a solution that would increase the reliability of their production process. Their existing pumps contained solenoid driven diaphragms, causing them to pulsate. Because of the problems originating from these pulsations, R.F. MacDonald Co. recommended upgrading to a more reliable and sophisticated Grundfos Digital Dosing pump. Grundfos Digital Dosing pumps use a camshaft to drive the diaphragm, which ensures an optimum mixing ratio of the liquid chemical dose while providing a significant reduction of pressure peaks within the system. This prevents mechanical stress and wear on parts such as the diaphragm, tubing, and connections, resulting in a lowered maintenance requirement. In addition to increased reliability, Grundfos Digital Dosing pumps are extremely easy to calibrate; requiring only a sample test run. After the results of the test run are entered into the digital control display, the pump automatically corrects itself to the desired output. Competitor dosing pumps take substantially longer to calibrate because they lack the ability to auto-calibrate like the Grundfos pumps. The installed Grundfos dosing pumps are now performing more reliably with less downtime than production with the previous pumps. The increased consistency of the wax application has not only lowered the input cost, but has also improved the quality of the fruit by applying a more even coating of wax. For this particular application, R.F. MacDonald Co. replaced the plastic ball bearings in the check valves with stainless steel. The heavier bearings cut through the viscosity of the wax much better, enhancing productivity by eliminating pump flow restrictions. For more information on pumps that can improve your facility performance contact R.F. MacDonald Co. today! A proven solution for a boiler that will improve fermentation, as well as provide condenser functions from the same unit – the Cleaver-Brooks Clearfire boiler. This is the approach that was recommended and installed at Charles Krug Winery in Napa Valley, and has provided increased reliability and efficiency in their overall process. The CB Clearfire is a boiler system that circulates water through both the boiler and a chiller to achieve any desired temperature, hot or cold. This dual feature allows Charles Krug to use just one system for both the heating and cooling of their wine tanks, which require different temperatures at various stages throughout the fermentation process. In addition, the Clearfire boiler features a combustion system with a pre-mix down firing burner, which is fundamental to achieving efficiencies up to 99% and NOx levels less than 20ppm. Find the right equipment and options for your winery by speaking with R.F. MacDonald Co., your boiler and pump solutions team. R.F. MacDonald Co. is proud to announce our recent expansion of Cleaver-Brooks representation into the Eastern region of Nevada, allowing us to now provide full service throughout the entire state. The expansion of our territory is a commitment to provide excellent products and services to Nevada boiler customers with a full product line of Cleaver-Brooks equipment. The Cleaver-Brooks product line includes boilers, burners, controls, heat recovery, water systems and exhaust solutions for commercial and industrial customers. From commissioning your system, to providing parts, service, rentals and training, R.F. MacDonald Co. can help your company manage your total boiler needs. We have over 50 years of experience in the industrial markets of California and Western Nevada with existing offices in Reno and Las Vegas. During the last ten years we have helped many companies understand and achieve the increasingly strict regulatory mandates that are required of their business. You will begin to understand as you read some of these case studies that there is no cookie cutter approach to our business. Our team assesses each individual situation and applies the best available technology to each specific case. With the increase in demand for California wines, process boilers are in great demand. Many of the smaller boilers that were not previously monitored are now required to obtain permits and comply with emission regulations as well. California now has new regultations that mandate seismic retrofitting along with emission reductions. As a result, many hospitals must begin to comply to these strict new codes. Nowhere in California are the new regulations more aggressive than in the San Joaquin Valley. In this region agricultural food processing plants have already experienced multiple compliance deadlines. Corporate offices, apartment buildings and lab facilities are not exempt from the new emission regulations on their equipment. At the conclusion of each class, participants are mailed a certificate. These certificates are approved by the California Water Environment Association (CWEA) and the Association of Facilities Engineering (AFE) and class hours can be credited towards continuing education requirements for re-certification.